Today Karuizawa whisky stands at the top of the global whisky industry, as the brand to rise most in value compared to any other whisky in the world, since 2013, according to auction and sales reports by Whiskystats.net. When the distillery’s doors shut in 2000, the distillery team could never have imagined what would happen to the Karuizawa brand. After all, since 1955 when the distillery started production, to its demise at the turn of the millennium, the majority of the whisky produced at Karuizawa went into cheap blends under the Sanraku Ocean brand. While the distillery released a single malt in 1976, it cost around $90 US, came in limited batches and was not marketed. By the 1980s the Karuizawa distillery experienced a huge refurbishment, new wash backs, malt mills, a shiny lauter tank, and a new aim to improve quality. Most of the casks bottled today by Karuizawa were distilled after the aforementioned upgrades, so we can thank these for the rise in quality we taste today. Sadly, as Karuizawa invested in quality, the 80s brought the crash of whisky consumption in Japan, and it only got worse. Finally, in 2000, the team had had enough and the distillery was mothballed. In later years, with Kirin as the new owners of Sanraku (renamed Mercian), the remaining casks of Karuizawa would be sold off, as Kirin was more interested in Mercian’s wine facilities. What has happened to the Karuizawa brand since is a combination of passionate fans, Japan’s revived whisky category, and a huge rise in demand for liquid never to be made again. Investments: Gold, Stocks, or Karuizawa whisky? After endless negotiations, the final Karuizawa casks were sold in 2011. 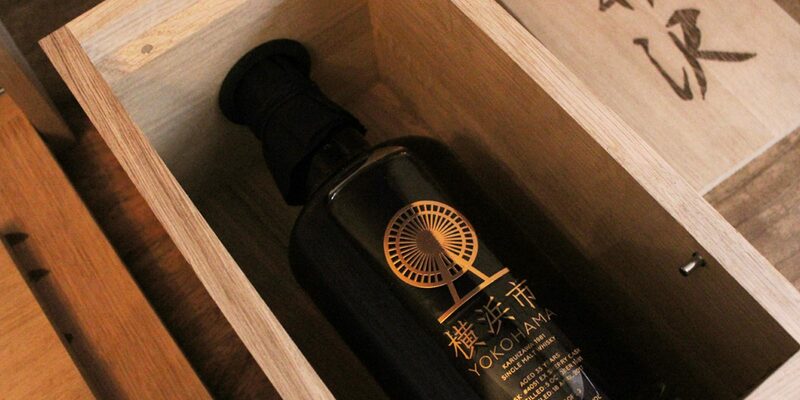 Following this, the oldest Karuizawa cask was bottled for the Tokyo International BarShow 2013. The 52 Year-Old release, with only 41 bottles made, sold then for around $17,000 US. This was spare change compared to today’s prices, especially since that same bottle sold 2 years later for over $118,000 at a Bonhams auction in Hong Kong, reaching more than ten times the initial retail price. In a nutshell, that one bottle can help one understand the growth Karuizawa whisky has experienced in the past 7 years. 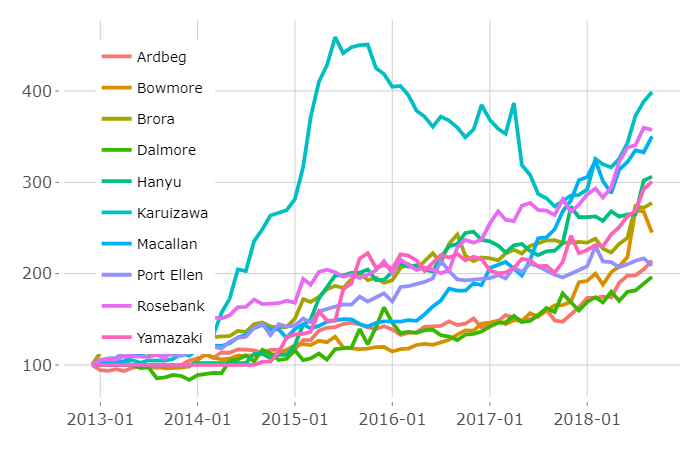 According to the Whiskystats Whisky Index, Karuizawa holds the 1st place among distilleries worldwide, when looking at their relative increase in value over the past 5 years. The Japanese legend even outperformed The Macallan and other silent distilleries like Rosebank, Hanyu, and Port Ellen. And, even though the brand’s growth has continued since 2013, it is showing no signs of stopping. Looking at 2018, Karuizawa whisky prices rose by 45.6% per cent, outperforming the overall secondary whisky market by 27.5%. Leading by example, the growth of Karuizawa is also said to be responsible for increasing the overall prices of other Japanese whiskies. 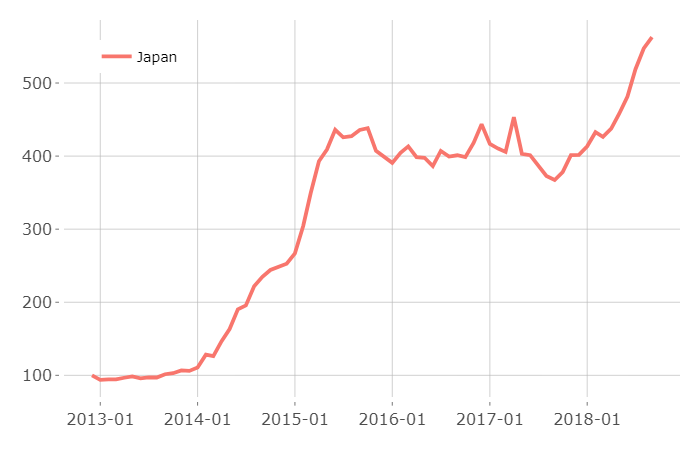 Japan was excluded from WhiskyStats’ global whisky graph since the Japanese Whisky Boom in the years of 2014 and 2015 launched the Japan index into spheres far beyond the other region indices. In September 2018 the 100 most traded Japanese whiskies gained 2.82% in value. The Japan graph below now stands at 562.78 index points. Karuizawa whisky has risen to become a global phenomenon, as both whisky and investment. Beyond cryptocurrency and the stock market, Japan’s whisky brings craft, history, and beauty into the mix, making Karuizawa both an investment and a passion. With only a handful of casks left to be bottled and the final bottles in sight, Karuizawa will only rise further in the coming years. The final cask is rumoured to launch around the 2020 Tokyo Olympics, bringing a beautiful ending to a timeless tale.